Why you should make the switch to natural – health benefits, allergies, chemical sensitivity issues, environmental impact, etc. How to go about making the switch – what to do with all those old products lurking beneath the sink. What products to use – store bought or homemade? Brand reviews and recommendations, recipes and more! Tips, tricks, and solutions from an industry expert. 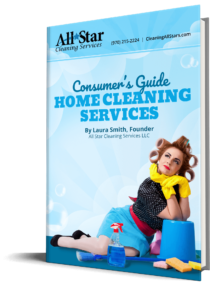 All participants will receive a booklet on Natural Cleaning, a sample bottle of all-purpose cleaner, and a special microfiber cleaning cloth. Workshops last between 30 minutes and an hour, depending on the amount of time your group wishes to allocate and audience participation. Give me a call to book your group’s workshop today at 970.215.2224 or email laura@cleaningallstars.com for more information.